We are excited to announce the publication of “Planning for Prevention: A Guide to Community Health Initiatives,” developed by the Northwest Regional Planning Commission in collaboration with Franklin County Caring Communities. Numerous community partners contributed to “Planning for Prevention, including RISE VT and the Northwestern Medical Center, Northwestern Counseling and Support Services, and the Franklin Grand Isle Tobacco Prevention Coalition. We owe a debt of gratitude to the Lamoille County Planning Commission and Healthy Lamoille County, who developed the first such regional guide. 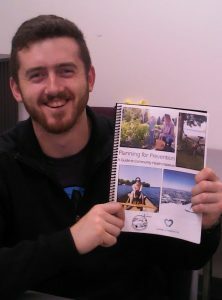 We are especially grateful to NRPC’s Americorps VISTA, Alyssa Henry, who put many, many hours of hard work and creativity into the guide. To download a copy of the guide, click here. This planning guide was produced under the auspices of the Vermont Department of Health’s Regional Prevention Partnership grant, which is funded by the Substance Abuse and Mental Health Services Administration (SAMHSA).